Big Bear is a small community with two large ski resorts, and one very big lake. Set in the San Bernardino forest, Big Bear is a rustic charmer. This website is your guide into lodging reservations and visitor services. 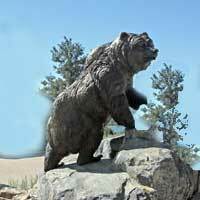 Big Bear is located just 2.5 hours from Los Angeles. Were actually closer than you think and the base of the San Bernardino mountains is just 1.5 hours away off of the 210 Freeway. Big Bear is both a summer and winter resort. Winter is all about skiing and activities revolving around snow. We have two big resorts, Snow Summit and Bear Mountain which are side by side. Staying anywhere in town, means just a 5-10 minutes to get to the other side. Lodging is available both slopeside, on the lake or in town. Summer is filled with hiking, fishing, camping and biking. The ski resorts transform themselves in summer to create awesome mountain bike parks and nature walks. You can even ride a chair lift to the top of the world. Welcome To Big Bear now take a hike! Use our menu to help navigate to learn more about the fun things to do when you visit Big Bear California. City Concierge at Big Bear is the source for vacation rentals, luxury home rentals and hotels. Offering the finest accommodations lakefront, near the slopes or with a view of the lake for families, group events and weddings.